The perfect Father’s Day breakfast idea. Kids will love whipping up these easy, sweet pancakes with perfect little pockets of oozing melted chocolate. Even though our daughter is still pretty young, she’s started helping in the kitchen. Sure, “help” involves my holding her up to the counter while she flips ingredients out of bowls and “blesses” flour and sugar and baking powder with a poke of the finger before I pour them in. And then when I have to put her down, “help” involves clinging to my legs until I give her a set of measuring spoons or a whisk and a plastic bowl to keep her occupied while I quickly finish (and, yeah, clean). One of her favorite things to do kitchen-help-wise is to plop blueberries into pancakes fresh on the griddle, so when I was trying to come up with the perfect father’s day breakfast idea for her awesome daddy, chocolate chip pancakes weren’t far behind. Whoever first thought of adding chocolate chips to pancakes deserves a wildly prestigious prize in my book. I mean, yeah – they’re not the healthiest breakfast in town, but definitely among the most fun. 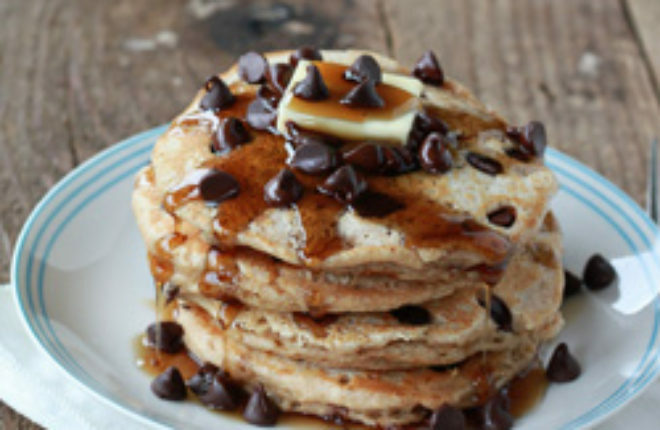 You’ve tried chocolate chip pancakes, right? Oozing melted chocolate? Super rich, crazy decadent, hard to stop eating, bellyache ensues if you’re not careful, totally worth it?? They’re as easy to make as regular pancakes. 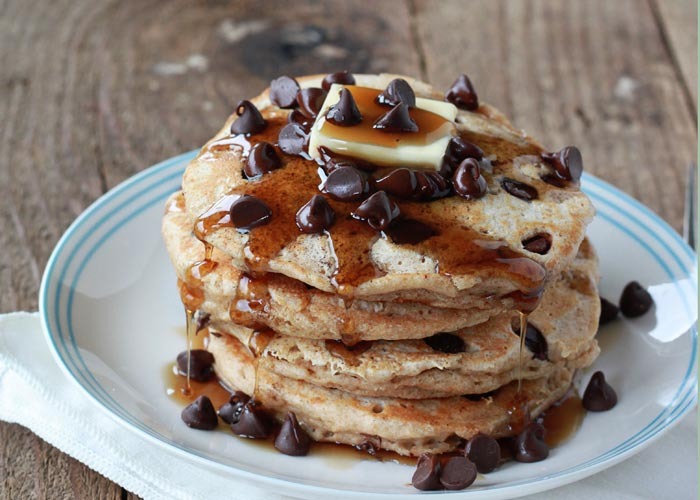 You just plop a few chocolate chips into the pancakes as they cook. Which makes them perfect for little ones to help make for Father’s Day breakfast. Hey, daddies like breakfast in bed too! And if you’re my guy, all the better if there’s chocolate involved. And bacon on the side. In a large bowl, mix together flours, baking powder, baking soda, sugar, salt, and nutmeg if using. In a medium bowl, whisk together the buttermilk, eggs, butter, and vanilla until blended. Heat a non-stick griddle to 325 degrees, or place a large non-stick frying pan over medium heat. Add a little butter, if desired. Scoop pancake batter by the scant 1/2 cup full onto griddle or pan. I like to use an ice cream scoop for this! Sprinkle chocolate chips over the tops of the pancakes. For me it works out to about 10 – 12 chips per pancake. Cook until the pancakes begin to look a little dry around the edges and start to form bubbles, about 1 – 2 minutes. Flip and cook for another minute or so until golden brown on both sides and cooked completely through (you might want to check one in the middle to be sure it’s cooked completely. If not, flip it back over and let it cook for a bit longer). 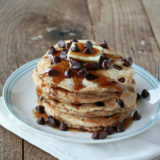 Serve with butter and maple syrup; sprinkle with additional chocolate chips if desired. In my book, a pancake is not a pancake without a few chocolate chips. They’re the best, and yours look so fluffy and delicious. A tu beaucoup de recette de ( pancakes ] , autant sucré que salé ? You need to stop posting pancake recipes because it’s giving me an inferiority complex. How do you get them so round and fluffy? And, um, not burnt? To avoid burning your pancakes, pre-heat your pan to about a notch below medium heat setting and keep it on that same setting as you cook. I used to make the mistake of starting the stove out too high because I wanted the pan to get warm quick; now I just pre-heat while I am prepping my batter. Your recipes are wonderful. I would love for you to share them with us at foodieportal.com. Foodieportal.com is a new food sharing site, we’re no photography snobs, we’re just foodies and we actually try hard to promote your pictures. At foodieportal.com all your food pictures will get accepted so I really hope you come and join us. 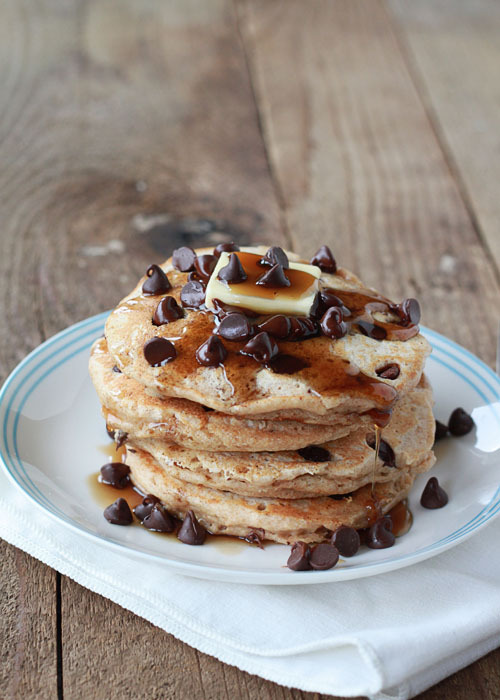 Chocolate chip pancakes are my absolute FAVORITE!! YUM :). One of my all-time favorite cookies is chocolate chip/cranberry…..perhaps they’d be a suitable combo for these pancakes? Just made these this morning and they are fabulous! I will definitely be saving this recipe and sharing it on my blog! What is the asterisk by “buttermilk” for?